The problem solvers are here. 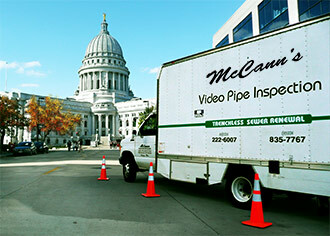 For over a quarter century, McCann’s Underground, Inc. has been dedicated to all aspects of high quality pipeline service, making it a leader in affordable sewer and drain rehabilitation, inspection and maintenance throughout the State of Wisconsin. Our staff is committed to meeting your municipal, commercial or residential needs in all areas of waste water system service: Trenchless pipe repair, grouting, service connection cutting, video pipe inspection, cleaning and more. McCann’s Underground, Inc. is always upgrading to the most “cutting edge” methods and equipment so that our clients obtain the best possible results at competitive prices.